As a rule of thumb, the United States does not negotiate with terror organizations – not even in order to release a soldier abducted in Afghanistan. Maybe for this exact reason, American newspapers attempted to explain to their readers Israel's willingness to swap over 1,000 prisoners for a single soldier. While the Washington Post argued that the massive public relations campaign staged by Shalit's family and supporters pressured the government into signing an agreement, the New York Times' Ethan Bronner attributed the decision to Israeli mentality and ethos of solidarity. "In trying to understand why Israel is scheduled to start trading more than 1,000 Palestinian prisoners on Tuesday for the return of just one Israeli soldier held by Hamas for the past five years, it is worth recalling that within Israel, certainly within its Jewish majority, the notion of a stranger is remote," Bronner writes. "When Israelis say they view the seized soldier, Gilad Shalit, as their own son, they mean it. "It is the melding of private and public spheres, the unwillingness to distinguish between what is good for the state and what is good for the individual that is seen by many here as Israel’s greatest strength – but by others as its greatest weakness," he explains, while quoting several Israeli columnists to highlight the varying opinions within the society. Meanwhile, an Associated Press article published by the Washington Post focuses on the commercial aspect of the campaign to release Gilad. "Gilad Shalit’s expected release…owes much to a public relations campaign that turned the Israeli soldier into an icon, portraying him as the nation’s son with bumper stickers, billboards and TV ads," the author claims. "PR firms and communications experts working for Shalit’s parents drove a sophisticated campaign that also enlisted celebrities, musicians and an army of thousands of volunteers. It was aimed at pressuring two Israeli prime ministers to negotiate the release of Shalit, captured in a daring cross-border raid by Gaza militants in 2006. "The PR efforts succeeded by fashioning him into the boy next door — a soldier who, in a country with mandatory military service, could be anyone’s child." The paper further describes the extensive campaign, saying: "TV ads plucked at heartstrings, tying Shalit’s fate to that of Ron Arad, an Israeli Air Force navigator who was captured in 1986 after his aircraft was brought down over Lebanon. 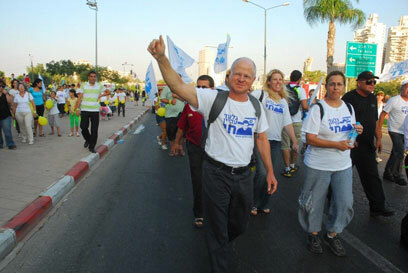 PR efforts aside, the author also emphasizes the emotional bedrock on which the campaign grew: " A national ethos of solidarity in Israel, an 'all for one and one for all' mentality necessary in a country with compulsory military service for Jewish citizens, helped the campaign encourage activism on such a large scale." See all talkbacks "The Shalit deal through foreign eyes"